The method of forming these openings, with or without reveals of different kinds, has been referred to at page 10. The depth of the reveal varies from 1/2 a brick or 4 1/2- inches, to 9 inches or the length of a whole brick. Such a reveal for a 2-brick wall in English bond is shown in Figs. 102,103, which give plans of two courses, the thickness of the reveal being half a brick in each case. Figs. 104, 105 illustrate the arrangement for a similar reveal in Flemish bond. A king closer is inserted at k, to avoid using the small pieces shown in dotted lines. Figs. 102, 103. 1/2-brick square Reveal, 18"-wall, English Bond. Figs. 104, 105. 1/2-brick square Reveal, 18" wall, Flemish Bond. 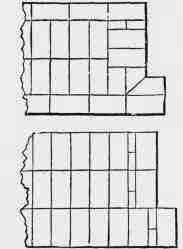 1 Section xiv. of the Building Act says: - "Loophole frames may be fixed within 1 1/2 inches of the face of any external wall - but all other woodwork fixed in any external wall except bressummers and story posts under the same - and frames of doors and windows of shops on the ground story of any building, shall be set back 4 inches at least from the external face of such wall." Figs. 106, 107 show two courses of a 9-inch reveal with square jambs for a 3-brick wall in English bond. Reveals are distinguished by the thickness of brickwork in front of the check left for the frame. Thus a half-brick reveal means a reveal such as those in Figs. 102 to 105, having a thickness of half a brick in front of the angle into which the frame will fit; while Figs. 106, 107, in which this portion is 9 inches thick, represent a "whole-brick reveal." Of course, in walls more than one brick in thickness, the reveal may be either 4 1/2 inches or 9 inches in depth. The reveals shown in Figs 102 to 107 are adapted for cased frames or heavy solid frames requiring a width of 4 1/2 or 5 inches. 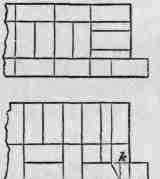 When lighter solid frames are used the width of the recess behind the reveal (a c Fig. 1 8) is often made only 1/4 brick instead of 1/2 brick, as shown in the figures. It would be impossible, for want of space, to illustrate reveals of all the different dimensions, in walls of various thicknesses, but the examples given will assist the student in drawing any reveal required. Reveals with Splayed Jambs are included in the Advanced Course, and will be described in Part II. Figs. 106, 107. Whole-brick square Reveal 2 feet 3-inch wall, Eng lish Bond.